Join a caregiver’s support group. Everyone needs help at times. 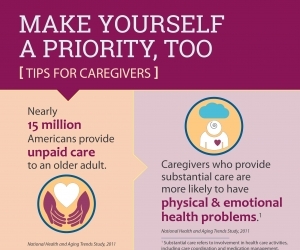 However, many caregivers find it hard to ask for help. They may feel they should be able to do everything themselves, or that it's not all right to leave the person in their care with someone else. Or maybe they can’t afford to pay someone to watch the person for an hour or two. Use national and local resources to find out how to pay for some of this help, or get respite care services. You may want to join a support group of Alzheimer’s disease caregivers. These groups meet in person or online to share experiences and tips and give each other support. Ask your doctor, check online, or contact the local chapter of the Alzheimer's Association . Caring for a person with Alzheimer’s takes a lot of time and effort. Your job can become even harder when the person gets angry with you, hurts your feelings, or forgets who you are. Sometimes, you may feel discouraged, sad, lonely, frustrated, confused, or angry. These feelings are normal. Even when I do everything I can think of, the person with Alzheimer’s disease will still have problem behaviors because of the illness, not because of what I do. For more information on coping, explore these resources for relieving stress and anxiety for Alzheimer’s caregivers. Understand why you've chosen to take care of the person with Alzheimer’s disease. Ask yourself if you made this choice out of love, loyalty, a sense of duty, a religious obligation, financial concerns, fear, a habit, or self-punishment. The National Institute on Aging, part of NIH leads the federal government effort conducting and supporting research on aging and the health and well-being of older people. The Institute seeks to understand the nature of aging and the aging process, and diseases and conditions associated with growing older, in order to extend the healthy, active years of life. For more information on research, aging, and health, go to www.nia.nih.gov. "The mission of Senior Help Desk is to enhance the lives of our seniors through the collaboration, organization and accessibility of resources. We strive to offer the most comprehensive, interactive, and shareable senior resource center for finding professionals, services and resources. We offer an interactive community timeline, resources directory, blogs, videos, articles, and a community events calendar." For more information go to: www.seniorhelpdesk.com.